I really like playing The Refrigerator Game (TRG). Most of you know it. It’s when you’re too lazy to go to the store, and you do have a few things in the fridge or pantry, so you take the challenge and make it work. It’s sort of the opposite of this game. I realize this is a very first-world concept – most of the globe makes do with what they have on hand on a daily basis by necessity, not choice, and some interesting meals have stemmed from this manner of cooking. Once, in the scorching Rajasthani desert, a local made a meal out of the local equivalent of nopal, salted yogurt and chapati with thick slathers of garlic ghee. It was a simple meal, the Indians I was with told me, made with what this woman had on hand and in abundance, not only because we were a hundred miles from anything that could constitute a store, but also because this is what she had. It was hands down one of the best meals of my life. I, myself, have become an expert at TRG, a skill born out of American laziness and sometimes necessity. Being unemployed and broke in New York in that fruitful year of 2008 basically mandated that I get creative with my cooking. I would pick up pastries that our local coffee shop threw out every night. That year I cooked some very creative meals involving stale bagels. In Guatemala, sometimes it would rain so hard I couldn’t be out for three seconds without being drenched. I made a soup with leftover broth, tomatoes, celery, cilantro from the garden and eggs, which turned into a nice little dinner. I later found out the locals already had a name of this meal – caldo de huevos – and that it was a popular hangover cure. That brings me to this morning, when I was trying to hunker down and write, not jet off to the grocery store for ingredients. In my fridge were eggs, tomatoes, lemon juice and labne, and in my pantry a hunk of bread I’d baked a few days ago during the snow. The process started with just a fried egg on toast, but then I thought it would be too dry, so a labne sauce was created and tomatoes chopped. Garlic was rubbed on the toast, and a good bottle of olive oil was rescued from the way back of the pantry. It was TRG at it’s best, when everything works so well you’d go out and buy ingredients especially to have this. Method (makes one serving): Mix together 3 tablespoons labne, a pinch of salt, half a teaspoon of lemon juice and a few chopped parsley springs. Dice half of a tomato into small chunks. Toast a piece of bread and rub a clove of garlic into the toasted surface. In a cast-iron or non-stick pan, heat 3 tablespoons olive oil over medium-high heat. Once hot, crack an egg into the pan and begin spooning hot oil over the egg. Repeat for about one minute. You’ll know it’s done with the edges are crispy and the top of the egg where you’ve been spooning olive oil is bubbly. 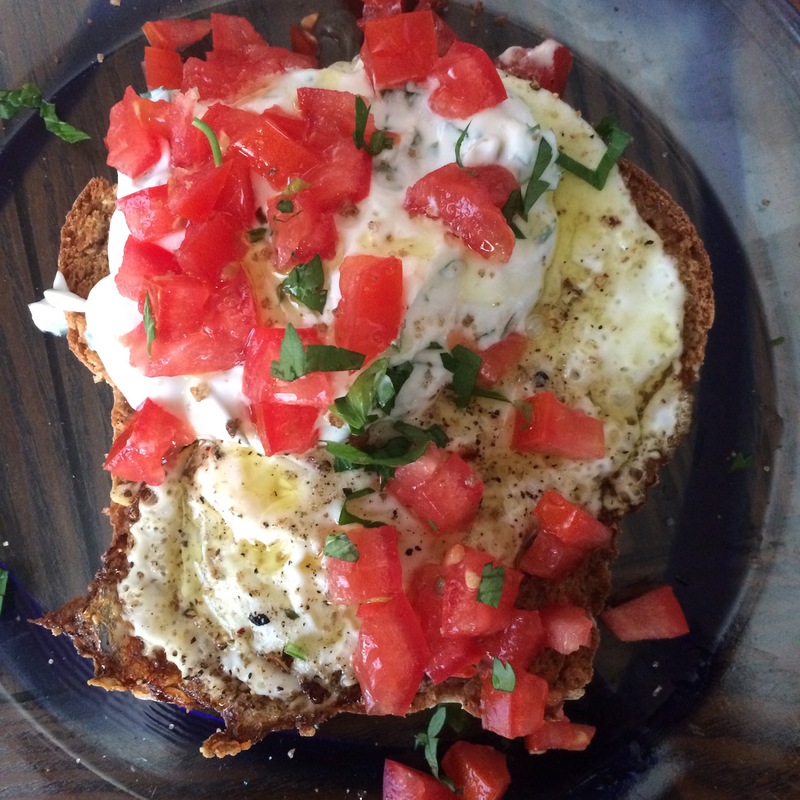 Place egg on toast, top with labne, tomatoes, a drizzle of olive oil and a sprinkle of flaky salt. Enjoy! Labne and eggs who knew? !